Logitech Rally delivers studio-quality video, unmatched vocal clarity, and RightSense automation for better, more natural meetings with most any software-based video conferencing service. Beautifully finished in matte black with slate gray metal accents. Copyright © 2019 ComXpert International CC - COPYING IS ONLY ALLOWED FOR THE PURPOSE OF SENDING US ENQUIRIES. E&OE. Logitech RightSight™ camera control automatically moves and adjusts the lens to comfortably frame meeting participants in rooms of all shapes and sizes. Future Availability: RightSight will be enabled by a software download, with initial support for Windows 10. Logitech RightLight™ technology with Wide Dynamic Range (WDR) prioritises faces over objects and surfaces, optimises light balance, and fine-tunes colour and saturation for natural results across all skin tones. The result is a balanced image that renders participants in flattering light with reduced glare and softer shadows, even in dim or backlit conditions. Rally Camera packs a 13-megapixel image sensor that captures up to 4K video at up to 30 frames per second, ideal for Ultra HD recording and streaming. The advanced 4K imaging system delivers spectacular quality at all HD and Ultra HD resolutions with brilliantly sharp video, outstanding colour reproduction, and exceptional optical accuracy. Simply connect to power (regional plugs included) and to PC, Mac and Chrome™ devices via USB. Rally Camera is UVC/plug-and-play compatible with virtually any video conferencing, recording, and broadcasting application that supports USB cameras. The best price and guaranteed service and backup from official computer suppliers in South Africa for the 960-001227 Logitech Rally Ultra HD PTZ Camera for Meeting Rooms. The Logitech 960-001227 Logitech Rally Ultra HD PTZ Camera for Meeting Rooms is available for R20805. The product is sold by ComX Computers as new. Prices are valid today 2019-04-23 (before 2019-04-24 , by quote, while stocks last). The product is expected to be in stock, although this is not guaranteed. 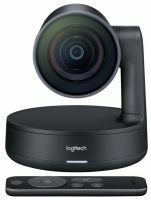 Find related 960-001227 Logitech Rally Ultra HD PTZ Camera for Meeting Rooms products in our Conferencing - Video & Audio Category for even more options. Read reviews and find out about 960-001227 Logitech Rally Ultra HD PTZ Camera for Meeting Rooms. Discounts, specials and cheap prices only at ComX Computers.